1. Heat the oil in a wok or frying pan. 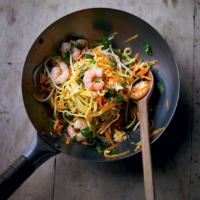 Mix together the noodles, prawns, carrots and beansprouts, and add to the pan. Stir-fry for 2-3 minutes. 2. Add the soy sauce and eggs and cook, stirring gently until the eggs scramble. 3. Stir in the chopped coriander and serve.